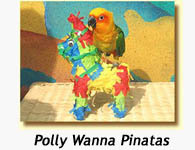 Polly Wanna "Candy Cane" Pinata bird toy is a treat anytime ... but would certainly be a fun toy to keep your bird entertained during the Christmas holidays. This candy cane comes with its own treats ... the nutritious kind that any bird will love. Watch your bird go to town as he discovers the special surprise inside.